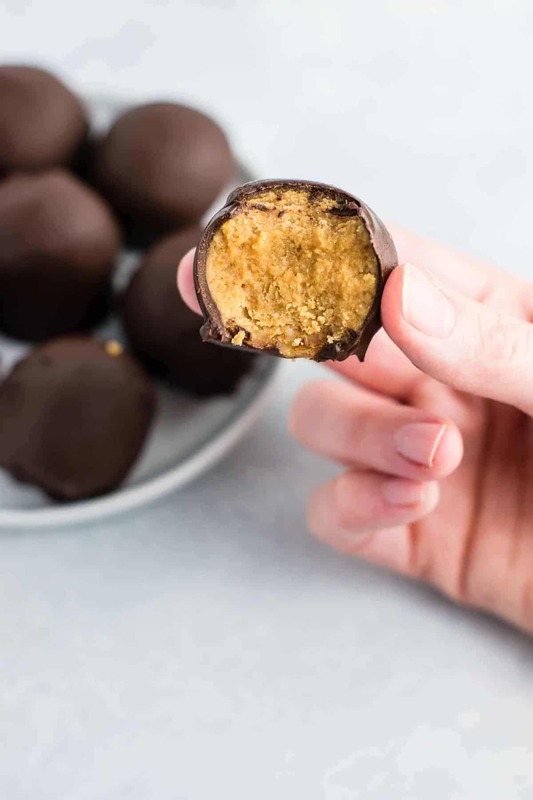 These healthy no bake peanut butter truffles are one of the Christmas desserts that I can’t wait to make this year! 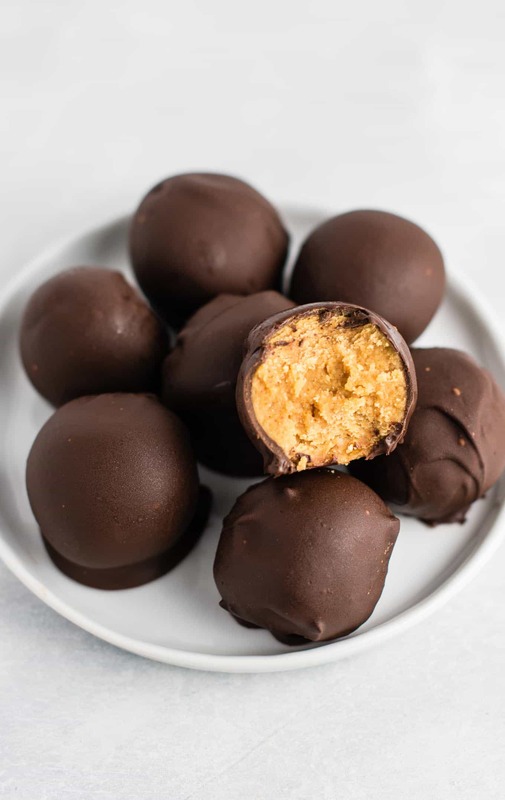 These delicious little bites are gluten free, vegan, and taste like a buckeye – my favorite! No worries if you have never made a truffle before, it is really so simple. All you need is a few ingredients and around 20 minutes to make this delicious dessert for your family this December! First, use a mixer to beat together peanut butter, maple syrup, coconut palm sugar, and salt for the filling. One note here – I used sugar free peanut butter in my recipe, and it’s the only kind I buy! Just look at the label and the only ingredients should be roasted peanuts and salt. Add in coconut flour slowly, until the mixture is not wet but not very dry. It should be easy to roll the balls without the mixture sticking to your hands. This will depend on your peanut butter texture how much flour to add. I used 1/4 cup of coconut flour as my peanut butter was drippy. Roll filling into small balls and place on a cookie sheet. Freeze for 5 minutes to chill slightly. While those are chilling, melt coconut oil and chocolate in the microwave (be careful not to burn). Once melted, stir in the salt to combine. 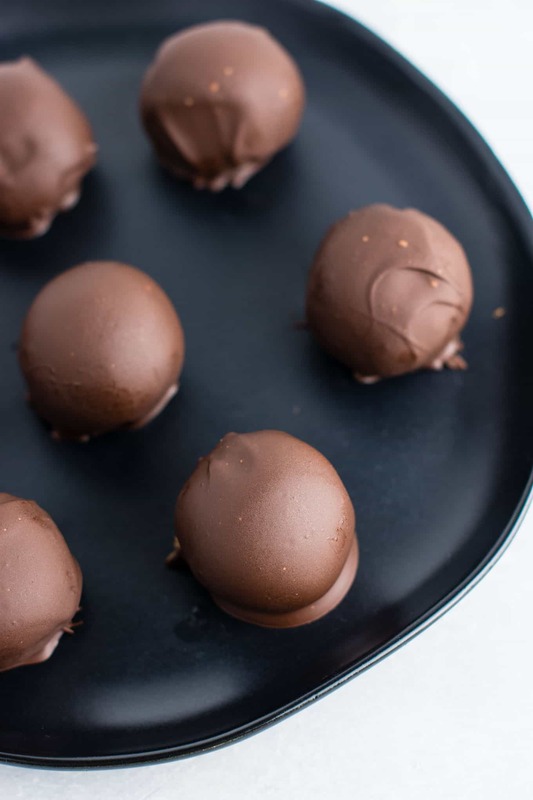 Freeze truffles until chocolate is set and you’re ready to eat! One note is that these will melt at room temperature, so it’s best to eat them straight from the fridge or freezer! 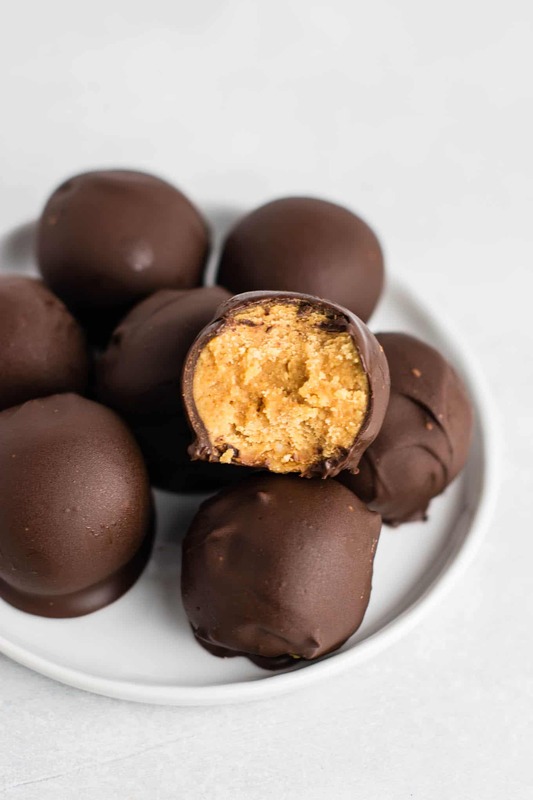 These no bake peanut butter truffles will be perfect for a Christmas dessert! 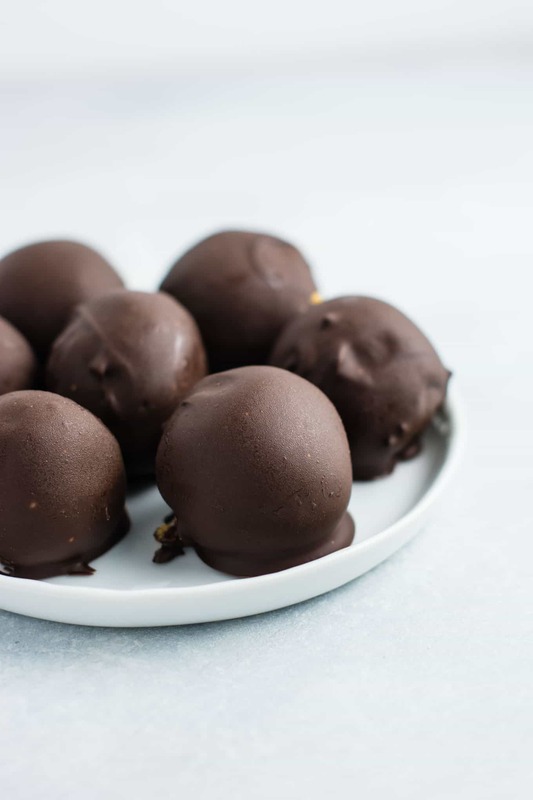 These truffles are super rich and indulgent and just one is the perfect dessert for me. I am starting a tradition of making these every single Christmas! Just one of these little bites will satisfy my dessert craving, but I bet you can’t have just one! I almost don’t even want to share these with any guests! To me, there is just nothing better than peanut butter + chocolate. Pretty much a match made in heaven. I am not exactly the most talented at truffle dipping, so there are not picture perfect. 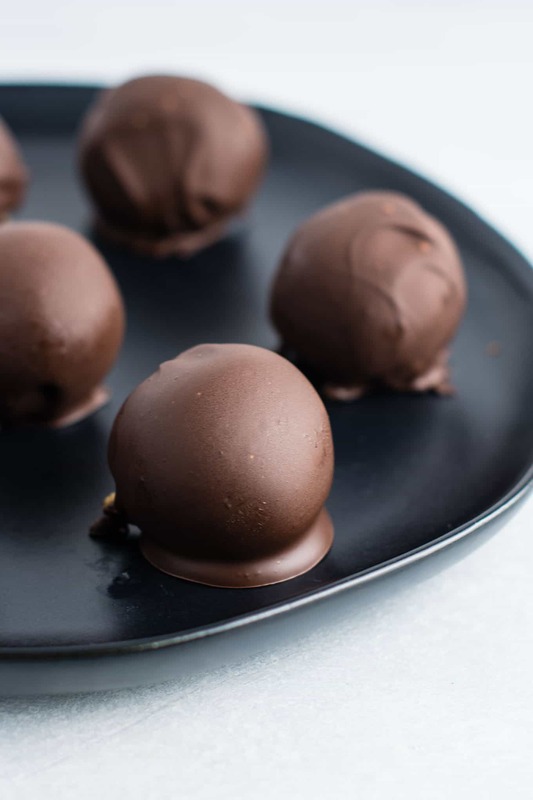 But remember, you don’t have to be perfect at cooking or baking, it’s the love that goes into it and these truffles will taste delicious whether or not they are perfectly formed! After dipping three truffles I handed the task over to my husband, who turned out to be much better (and patient) than me. Whether they look pretty or not, they are so delicious that no one will care about how perfect your truffle skills are. Looking for more delicious no bake recipes? These babies are served best straight from the freezer. They’re really so simple to make and no baking required.